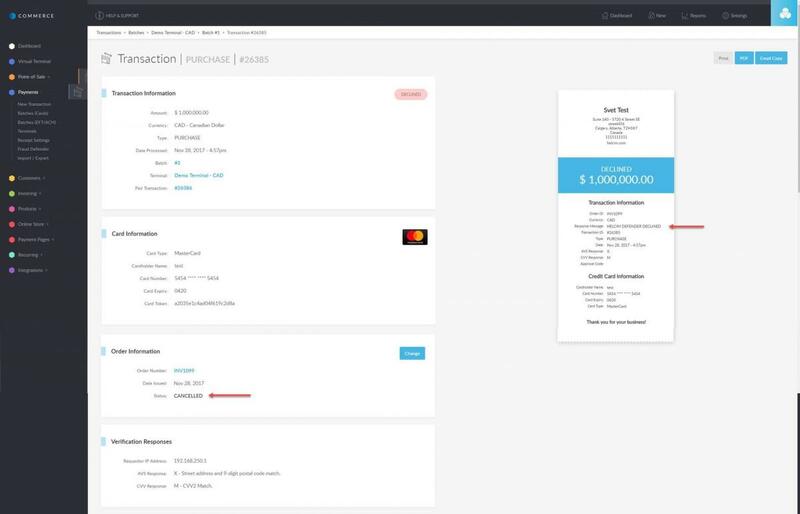 To learn about Helcim Fraud Defender, please see https://www.helcim.com/support/article/756-helcim-commerce-helcim-fraud-defender/. Enable Fraud Defender by turning the status ON. You will have to agree to the terms of service, which state that this is an estimation of risk based on transaction factors listed below and there are no guarantees made on the transaction or chargeback outcome. When Defender is activated, you are able to manually review the Defender scores from the Payments tab and make a decision on whether to keep the transaction or void it. Defender can be set to automatically void e-commerce transactions (Payment Pages, Online Store, Commerce API, Helcim.js and third party plugins like WooCommerce, Magento, ECWID) that do not meet your selected criteria, see below for information on the 2 auto-void options. You can use one, or both options together to help detect suspicious transactions. When an address is entered under billing information, the Address Verification System (AVS) checks the entered address against the one registered with the cardholder's issuing bank and a certain response is provided in the form of a letter code. You can set the Fraud Defender to Void (cancel) any transaction which does not produce a specific code. For a list of codes, please see https://www.helcim.com/support/article/240-general-resources-avs-response-codes/. For example, you may decide that you want any transaction where the address doesn't match to auto-void, so you would enter D,F,M,X,Y,Z. Generally speaking, transactions where the billing address does not match the address registered to the card are considered higher risk. What happens when Fraud Defender auto-voids a transaction? When the Fraud Defender is enabled and auto-voids a transaction, your customer will receive the following error message: "transaction declined - please contact us." You can view the transaction details and score by going to the Payments tab. Find the declined transaction and click on it. Under Order Information the status will be listed as CANCELLED, and your merchant facing receipt will say HELCIM DEFENDER DECLINED. See below. When a transaction auto voids, it is an indication that something could be wrong. Please review the information to ensure you are comfortable with the transaction/order/customer. You could ask for another form of payment to see if that improves the result. You should always pay close attention to your transactions to prevent fraudulent orders, use of stolen cards and the resulting chargebacks. For further information on reducing chargebacks and fraudulent online orders, click here.